Seeing that deforestation is related to energy policy. At first glance these issues of forests and fuel may seem remote from your life and distinctly different. They are neither separate from you nor from one another. Forests and fuel actually define how we live and the way we live is altering the ecological functioning of water, energy, air and land. "A whole generation of young Americans was ready to abandon 'the american way of life,' with its conspicuous consumption and mind-numbing frivolity." about 1971, by Andrei Codrescu. Each piece of the climate pie is related to how you, me and one billion other well-off people consume 30% to 55% of the world's resources. We do this to maintain our standards of living. About 2% of the US population own and control 90% of this nation's wealth. While the extreme unequal distribution of wealth that characterizes Brazil, Indonesia, India, or Thailand is not prevalent in America, there are disturbing parallels. The underlying consumption that we promote is quickly depleting the wood and fuel resources of the world to the death of its species richness, its functional capacity to purify our wastes, and its ecological variety. We don't do this out of malice or ignorance, instead we are part of a production system that narrowly defines and allocates rewards. We rationalize that cutting forests and consuming fuel adds to our prosperity as measured by the gross domestic product (GDP), but the ecological dimension of this economic activity is an inverted mirror. How well we live is becoming inversely proportional to how poorly the planet can provide for us. Critic and global analyst, Alan Durning, suggests "The world has three broad ecological classes," not unlike modern air travel but more insidious where the health of the community and the planet are concerned. He says that these separate and unequal classes are: 'the consumers, the middle income, and the poor." He further delineates their character by distinguishing each groups, dietary, transportation and material needs. Despite the gross, global perspective that tends to ignore personal and regional differences, Durning argues that "The consumer society was born in the United States in the twenties (1920s) when brand names became household words, when packaged, processed foods made their widespread debut, and when the automobile assumed its place in the center of American culture." He articulates the facts that reveal the use of minerals since 1950 on a per capita measure among the "consumers" has doubled! Car ownership and the cement that highways depend on has quadrupled. The amount of plastic we use has quintupled and the sevenfold increase in aluminum mean that we must use more electricity per pound of these items than is needed in the production of wood, tin or steel. Air travel has increased a staggering 33 times. If just the materials that each person uses is accounted for the profligacy of the consumer class, because of the impact this has on ecological communities, is seriously disturbing the assimilative capacity of woods, streams, farms and fisheries to nourish our needs. Donald Kaufman, a zoologist at Miami University in Ohio, has examined just the daily consumption habits of the United States. These patterns reveal the deeper character of our "impoverished" living standards despite our apparently abundant wealth. The population of the country is 260 million, today in 2012, it is over 314 million people. eat 815 billion calories of food (200 billion more than we need). Simple division will reveal that per capita consumption is connected to personal waste disposal and that these habits of mindless response to wealth without responsibility are threatening to obliterate our beaches, pollute our streams, trash our highways, and foul the air we breathe. Beneath these categories used by Durning and these statistics offered by Kaufman is a more serious behavioral problem that must be seen as intimately linked to timber and energy production. The necessity of wood from forests that are renewable and the need for fuels that are not renewable [such as oil, coal, gas and peat] have led us to expect that we can meet our needs without serious changes in how people live, work, recreate and nourish themselves. Each personal decision among the members of the class of consumers has a disproportionate impact on the planet than do the choices of the other two larger classes of the population. Behavior, even individual choices, has a collective impact on the conditions of the entire world because we live in a global economy, with rapid communication and transportation and the biological capacity to physically alter the landscape, air and water. 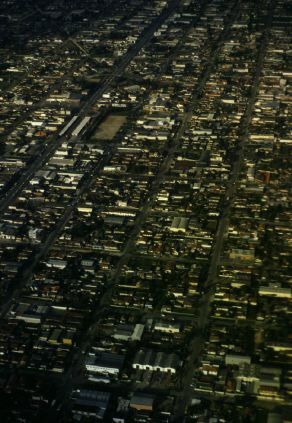 This view of a typical suburb [San Fernando valley in California] is just one example of how personal behavior leads to collective decision-making that influences the quality of our life and the lay of the landscape. By analogy, our collective decisions for home heating, air conditioning, low mileage efficiency transportation and even pools and lawns rely on enormous amounts of fuel, water and air. The links are unseen among these primary supports for our way of life, but they are, nonetheless influencing the environment. In this picture the dark areas absorb solar radiation and the light areas reflect heat. Every city, because of this physical characteristic of radiation, generates "urban heat islands" where the temperature is several degrees higher than the surrounding rural landscape. When rainwater falls on this setting it moves quickly down the streets and into drains adding to the impervious surface area and denying the groundwater sufficient recharge to raise the water table. This is a picture of the consumer landscape, the city and suburb that pump water into and wastewater out of their premises using electricity. From just this small view we can understand how half of our energy use is for transportation of people and commodities and how one-third is used to heat and/ or cool our homes, factories or businesses. Because of the first law of ecology -- everything must go somewhere -- space is not only limited, but the by-products of this frantic use of water, energy and land are usually building up in the air. Cars generate nitrogen oxide that turns into acid rain in the atmosphere. Because utilities that burn oil, coal or gas generate sulfur and carbon dioxides the air is affected in two different ways. Acid rain due to the sulphur sharpens its impact on streams and woods decreasing the productivity of our timber and fisheries. The carbon, however, acts as a trap for incoming solar radiation because the molecule of carbon dioxide has the ability to absorb radiation (short wave and ionizing) and give off heat (long wave radiation). As the atmosphere re circulates pollutants its temperature also increases. Chemical reactions are sped up and the capacity to hold moisture increases as heat rises. Because the air is warmer in some places and wind patterns change due to the heat over 250 scientists on the International Panel on Climate Change, warned in 1996, that human activity is altering the earth's atmosphere with long-term consequences that are largely unpredictable. How we meet the challenge of this combination of ecological problems depends on the alternatives we see to these and other competing world issues. Ecological problem solving requires that we weigh the different alternatives as we seek to protect our security and continue a more modest way of life.